Phlebia radiata is an orange to pink crust fungus that spreads itself across the dead wood of hardwoods and conifers across North America. It has a wrinkled surface in which the wrinkles radiate outward, more or less, from a central location. It does not develop pores, and it does not develop a cap structure or even, usually, a folded-over edge. Ecology: Saprobic; spreading across logs and stumps of hardwoods or conifers; annual; causing a white rot; spring, summer, fall, and winter; widely distributed in North America. 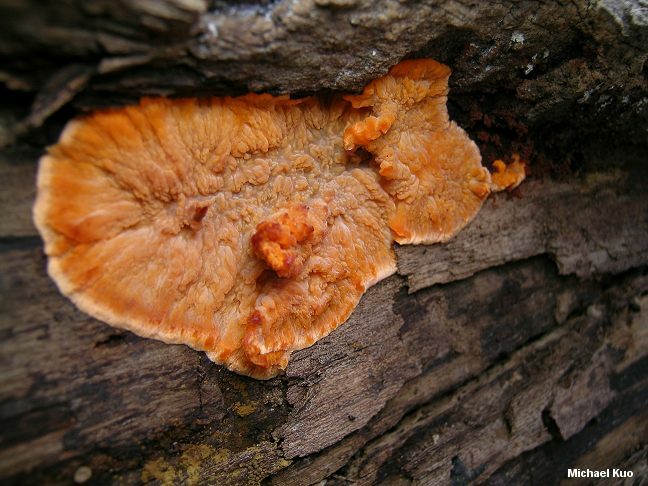 Fruiting Body: 1-10 cm or more across; irregular in outline; up to about 3 mm thick; surface wrinkled, with the wrinkles and folds radiating from a more or less central point; orange to pink (more rarely tan with orangish edges, or purplish); occasionally developing a slightly folded-over, hairy edge. Microscopic Features: Spores 4-5.5 x 1.5-2 µ; smooth; sausage-shaped; inamyloid. Cystidia cylindric to clavate; up to about 100 x 10 µ. Clamp connections present. REFERENCES: Fries, 1821. (Saccardo, 1888; Cooke, 1956; Ginns, 1976; Arora, 1986; Breitenbach & Kränzlin, 1986; Phillips, 1991/2005; Lincoff, 1992; Barron, 1999; McNeil, 2006; Miller & Miller, 2006.) Herb. Kuo 11120502. 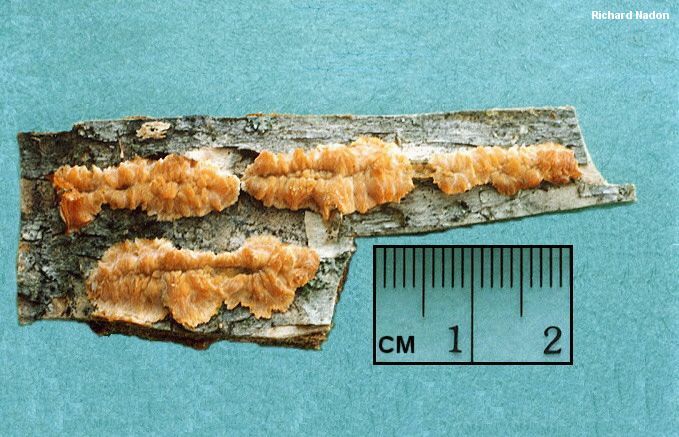 Phlebia merismoides is a synonym.